Thanks to Justin Gage for this zingy drink! He’ll get an Out of the Frying Pan T-shirt. 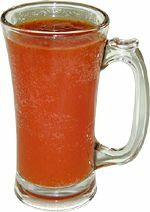 Combine beer, tomato juice, Worcestershire, salt, pepper and Tabasco in a beer mug. Stir gently. Garnish with a lime wedge, if desired. This entry was posted on Friday, September 21st, 2007 at 11:52 am	and is filed under Beverages, Master Recipe Index. You can follow any responses to this entry through the RSS 2.0 feed. You can leave a response, or trackback from your own site.